Scientists have deciphered the genetic blueprint of the duck-billed platypus, one of the oddest creatures on Earth. The animal comes from an early branch of the mammal family, and like mammals it is covered in fur and produces milk. However, it lays eggs like a reptile. Researchers say this unique mixture of features is reflected in its DNA. The genome sequence, which is published in the journal Nature, holds clues to how humans and other mammals first evolved, they add. The platypus (Ornithorhynchus anatinus) is the latest in a string of mammals, including the mouse, rat, sheep, horse and dog, to have its genome decoded. But it is the only member of the monotremes (egg laying mammals) for which we have a genetic blueprint. Dr Chris Ponting, of the MRC Functional Genetics Unit at the University of Oxford, UK, is one of more than 100 researchers from the US, UK and Australia, who took part in the study. He said the platypus was chosen because of its unusual features. The platypus is so strange that it was considered a hoax when sent from Australia to European researchers in the 19th Century. "It has a very weird appearance because it's a mishmash of the bill of a duck, the eyes of a mole, the eggs of a lizard and the tail of a beaver," Dr Ponting told BBC News. "It was one of several (mammals) we could have chosen, but it was certainly the one that everyone seemed to wish to sequence because of its unusual features." Dr Ponting said the genome sequence enabled scientists to look back in time to see what an early mammal would have been like. He said: "It's wonderful to see all of the different mishmash of features that the platypus exhibits; to see those features reflected in the DNA, in the genes of this creature, which has held mysteries for the scientists and the general population ever since it was discovered 200 years ago." The DNA came from a female, nicknamed Glennie, which was captured in the wild in New South Wales, Australia. 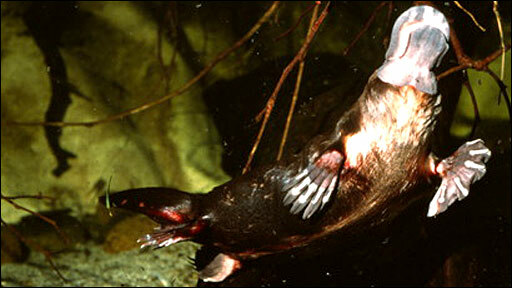 The sequence was then compared with stretches of DNA from about 100 platypuses living in the wild. Dr Mark Batzer, from Louisiana State University in Baton Rouge, who also worked on the study, said the data would help in conservation efforts by allowing scientists to investigate population size, structure and breeding habits. "In the case of the platypus, clearly we learned a lot about a unique organism that has relevance in terms of its endangered status and conservation biology," he said. "One big surprise was the patchwork nature of the genome with avian, reptilian and mammalian features," he added. The platypus and the small spiny mammal known as the echidna are the only existing species of monotremes in the world. All other mammals give birth to live young. 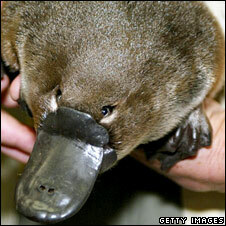 The platypus is widespread in the eastern states of Australia, living in and around streams and rivers. They have acute sight, but only open their eyes above water. Underwater, they rely on touch and a special sense called electro-reception that allows them to detect tiny changes in the electrical field generated by their prey.